The late eighteenth century was an age in which rationalistic and formal considerations dominated contemporary thought. In the music and forms produced in this age, balance, proportion and equality in the range of emotional and structural elements were some of the most important considerations. From our present viewpoint, the "sonata-form" is often thought to have been the most prevalent and durable means of achieving this balance, proportion and equality. A large proportion of the music composed during this age contained at least one movement in what came to be called "sonata-form." The fact that this form appears in settings as diverse as solo piano to full symphonic orchestra causes one to wonder if it underwent any modifications from one setting to another, and if so, what they were. It is these modifications that I have attempted to examine; more specifically, any modifications that may occur in representative works of Mozart's mature instrumental ensembles. Because our present concept of "sonata-form" is a post hoc one, I have put the term in quotation marks throughout the article. The topic divides into two types of treatment: textural and instrumental. Using the solo piano sonatas of Mozart as a point of reference, I considered first the textural treatment as it may influence each "sonata-form" in our corpus, then the instrumental treatment. I have chosen only works from Mozart's mature period, mainly those years of composing after 1785. The reason for this is to limit the study to works with a consistent style of composition for comparative purposes. His biographers have divided his life into three decades: 1762-71, 1772-81, and 1781-91.1 This third period is generally considered the one of full maturity and is the one during which the works in this study were composed. Thus it is necessary to view the sonata movements under discussion with an understanding of the eighteenth-century concepts of the term. The reason for this is to clarify the laws of "sonata-form," written or unwritten, with which Mozart may have felt obliged to comply. Only by doing this can his compositions be placed in a perspective as to their adherence to these laws. For this reason a brief survey of important eighteenth-century writers on the sonata has been made. The other division of the second section (also labeled development) continues Koch, may have some effective theme from the first section, or only an element of it, extended, transposed, or dissected in the same voice or by exchange with other voices. This theme gradually modulates through near and remote keys until the home key is restored at the end of the division, or until the dominant key is reached, after which a return is made that derives from the first section. The final section (or what would later be called the recapitulation), Koch says, gives preference to the home key and "starts most often with the [main] theme, though sometimes with another melodic idea. "13 A modulation to the subdominant key follows, with the preferred ideas being brought together, but without a cadence and with an early return to the home key. The allegro now ends with the repetition in the home key of the "latter half" of the first section, from the point where the dominant key was reached. In anticipation of my conclusion, I contend that the textural treatment in the mature instrumental ensembles affects the "sonata-form," mainly through the expansion of this form. In this study four types of texture are considered: polyphonic, homophonic, monophonic, and chordal. Thus the linear to vertical texture discussion progresses from linear to vertical texture. By their very nature, pieces with more instruments and variety of color tend to favor polyphonic treatment. In the works under discussion polyphonic texture falls into two broad categories: imitative and nonimitative. Moreover, the imitative texture falls into two subcategories: strictly imitative and freely imitative. Canon is the strictly imitative device, whereas fugato, stretto, and dialogue are the freely imitative ones. Canonic treatment serves as one main way of extending passages, especially in works with several instruments. Thus it occurs noticeably in Symphony K551. Canonic texture appears no fewer than ten times throughout the finale, considerably expanding the "sonata-form." Its first use in the movement is as follows: Mozart uses two separate ideas in the tonic area of the exposition before his bridge and modulation to the dominant of the dominant. After the statement of the second of those ideas and after the modulation which follows, one would expect him to continue immediately with the first theme in the dominant area. Instead, he dwells on the dominant of G—D—writing canonic texture involving seven instruments in two parts (measures 64-73). This procedure extends the transition area for ten measures. Three other canonic extensions appear prior to the start of the development in Symphony K551. In the first of these, the third theme chases itself in canon over a D pedal point for seven measures, extending the dominant of the dominant. In the second of these, the fourth theme appears in a four-way dialogue involving a canonic texture, reestablishing the dominant (measures 98-110, see Ex. 1). Finally, after a brief hint of the key of the Neapolitan of D (E-flat), the second idea occurs in canonic texture for ten measures in inversion involving three statements, confirming the key of G (measures 135-145). 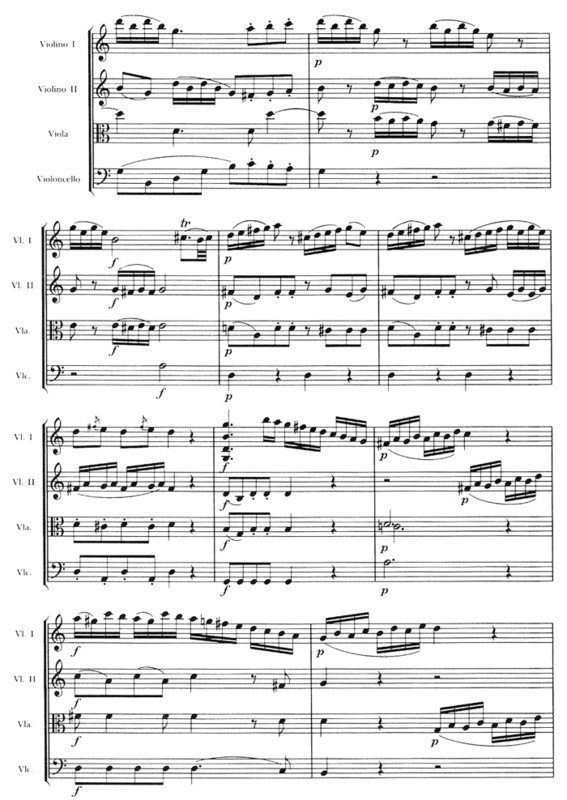 Thus by the time Mozart has firmly established the dominant tonal area through the use of canon, he has already added no fewer than 70 measures to the exposition. Furthermore, it is the setting provided by this texture that enables him to persist in the same basic tonal area so long without losing the listener's interest. Still more canonic extension occurs in the development of Symphony K551. 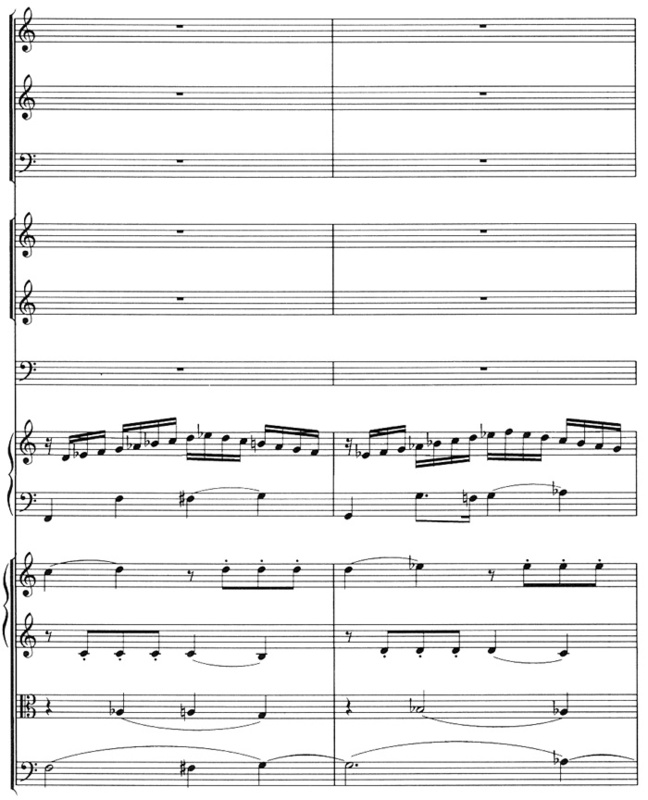 Shortly after the beginning of the development, the second idea appears four times with this treatment, at the octave (measures 172-189). Again, this canonic extension permits Mozart to keep the interest alive while maintaining the key of G for an extended period of time. To cite yet a sixth example of the ten canonic treatments in this movement, I call attention to the end of the recapitulation. The music has arrived at the tonic. 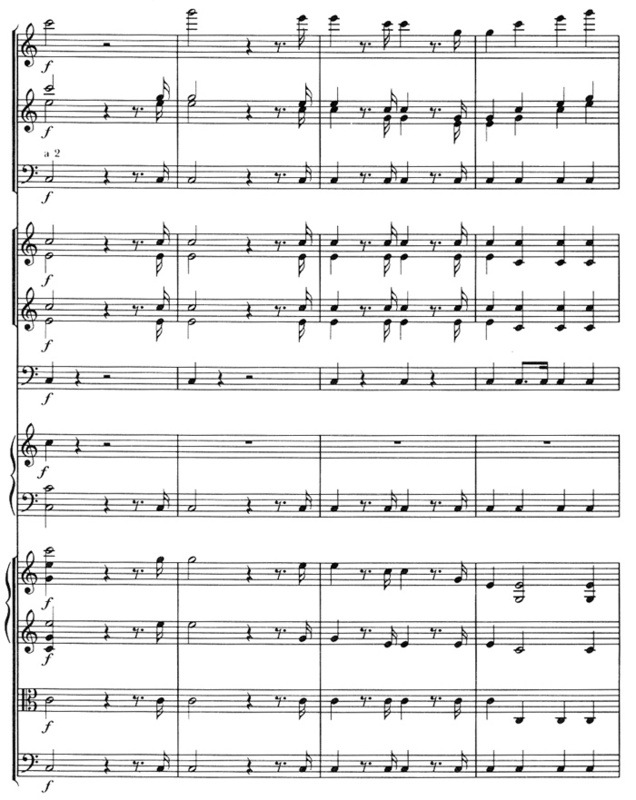 At this point Mozart could proceed directly to the coda, which is introduced by the tonic functioning as the dominant of the subdominant, F. Instead he introduces canonic texture which involves the second of the initial ideas in the tonic (measures 306-371). By stating this idea upright and in inversion he is able to extend the coda for 12 measures. Even more in the coda which follows the recapitulation Mozart uses not only canon but other polyphonic devices. These extend the coda until it becomes a virtual second development (measures 360-422). A fugato on the initial idea (stated first in inversion) begins the coda, establishing F, the key of the subdominant. Then the coda continues with canonic treatment of the second initial idea, combined with the initial idea (measures 372-401). 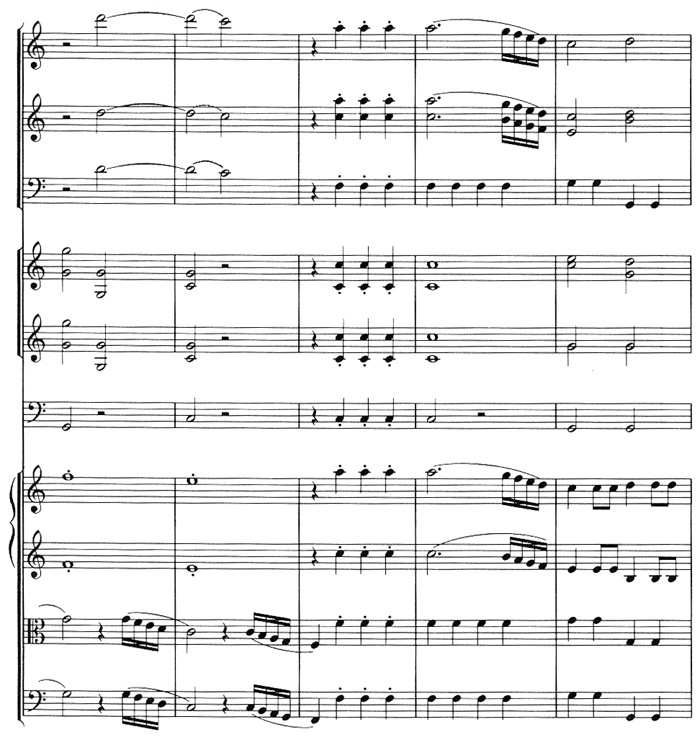 Gradually Mozart introduces five initial ideas stated in quick succession, the entrances of which occur gradually closer and closer until presently they all occur concurrently (measures 372-402). 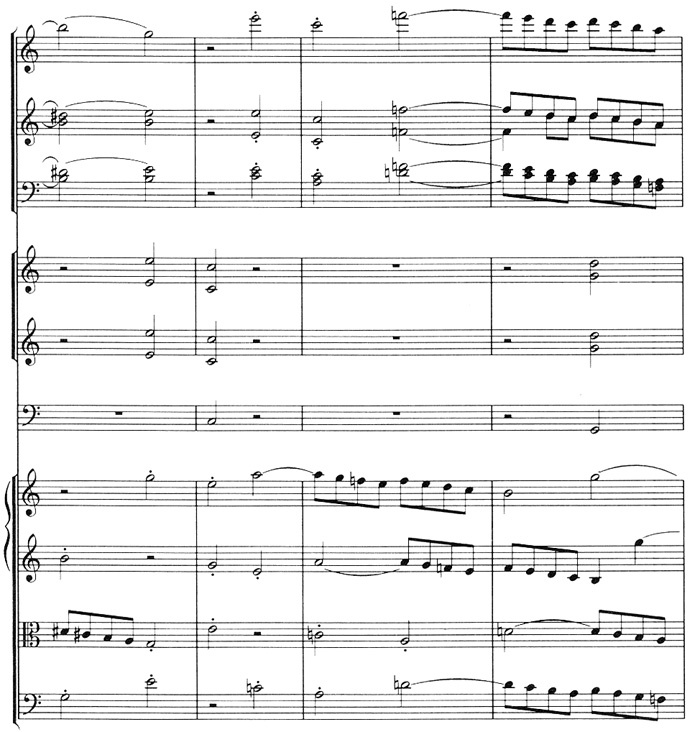 Not only does this polyphonic texture in the coda considerably heighten the intensity of the music, it greatly extends the compass of the movement by the addition of some 75 measures. Fugato serves as another important way of extending passages, occurring frequently in works with several instruments, notably in St Qt K465. Fugato here serves to extend the transition area of the exposition from the tonic to the dominant. 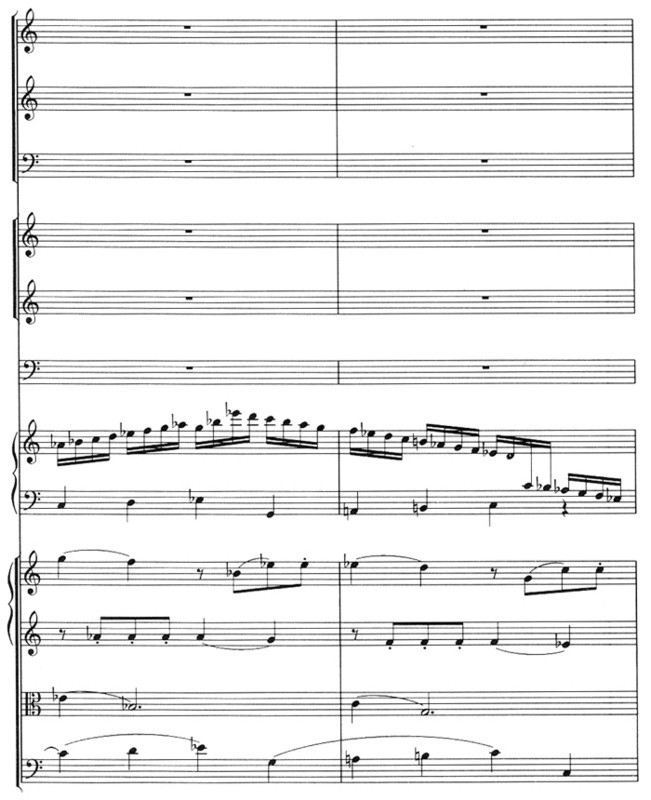 In the fugato, which is on the opening theme, the voices enter at one measure intervals successively through all the parts, beginning with the cello (measures 44-47, see Ex. 2). Fugato in Symphony K551 not only extends the exposition, but in so doing abruptly interrupts the normal progress of the "sonata-form." Mozart has presented two themes in the tonic area and cadenced on G (not in G, measure 35). The listener fully expects the music to continue in the dominant with the statement of the themes. At this point a strict five-voice fugato on the first theme works its way through the string section (measures 36-53, see Ex. 3). Not only does this treatment prolong the exposition, it also reaffirms the area of the tonic instead of the expected dominant. In the works under consideration, Mozart prefers the freer types of imitative texture, stretto and dialogue, which pervade his mature works. These two types of imitation differ in their treatment of thematic material. Stretto imitation involves restatement of the thematic material before the previous statement has finished. In dialogue imitation the statements of the thematic material occur separated by material other than that derived from the theme. Stretto serves Mozart as another main way of extending passages. It expands the introduction and exposition of St Qt K465. The slow introduction grows almost entirely out of stretto treatment of motivic materials. Textures that connect one stretto to another, although still based on contrapuntal treatment of the initial motive, involve counterpoint of a much less strict nature. 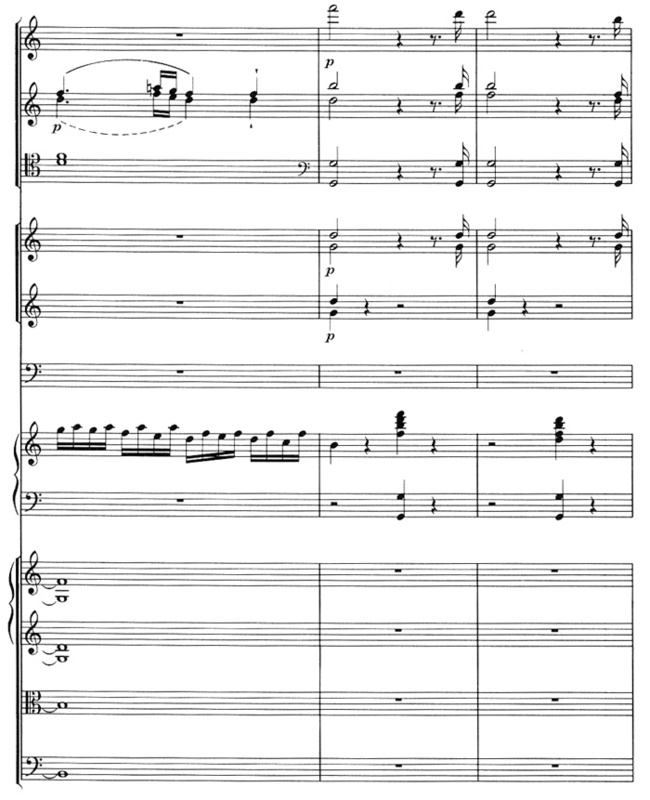 In the exposition (measures 23-106) the first two-measure unit of the main theme becomes the subject of stretto imitation. Such imitation results in an extension not only of the exposition, but of the entire movement. Stretto extends the transition from the tonic to the dominant area (measures 50-53, see Ex. 4). It extends the area of the contrasting theme (measures 59-61, see Ex. 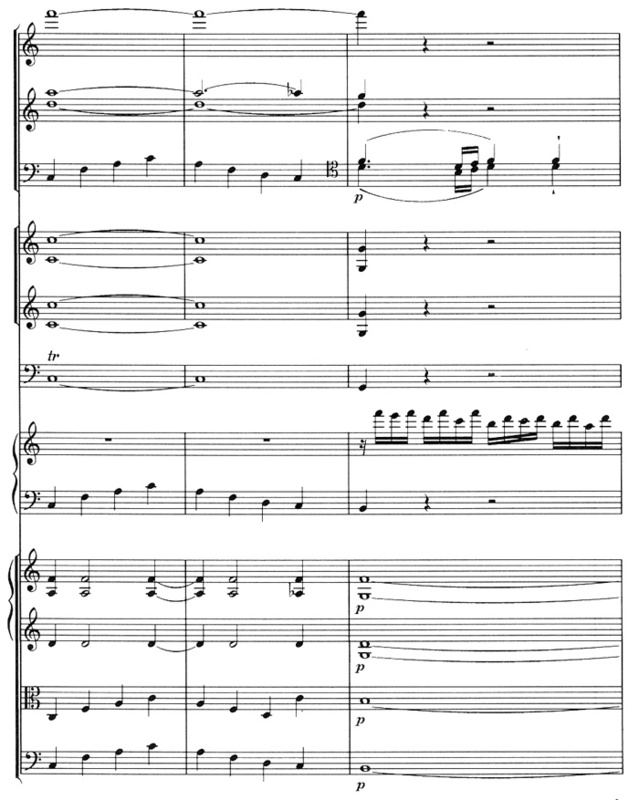 4) and that of the closing theme (measures 77-84). No fewer than 12 measures, or one-fourth of the development involves stretto (measures 113-16, 132-35, 139-42). Treatment similar to that found in the exposition appears in the recapitulation where stretto occurs at least four times (measures 163-66, 179-80, 197-203, 227-30). Half of the development of P Trio K496 grows from stretto treatment of part of the main theme (measures 85-93, 97-104). The entire section involves imitation, but only the designated measures are strict stretto. The coda of Qt K493 grows almost completely from similar treatment. These eight measures (247-254, see Ex. 5) involve almost constant stretto texture, by which means the coda of the movement is extended. 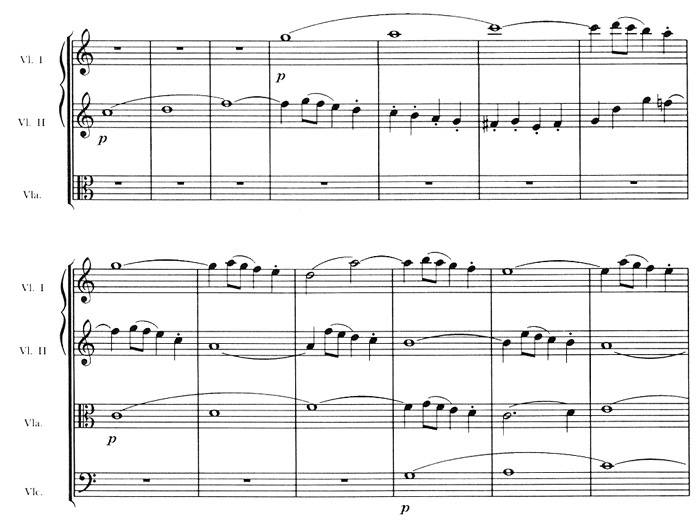 Stretto not only serves as a unifying element in Concerto K503, but it also provides a setting by which the first movement is expanded beyond 400 measures. 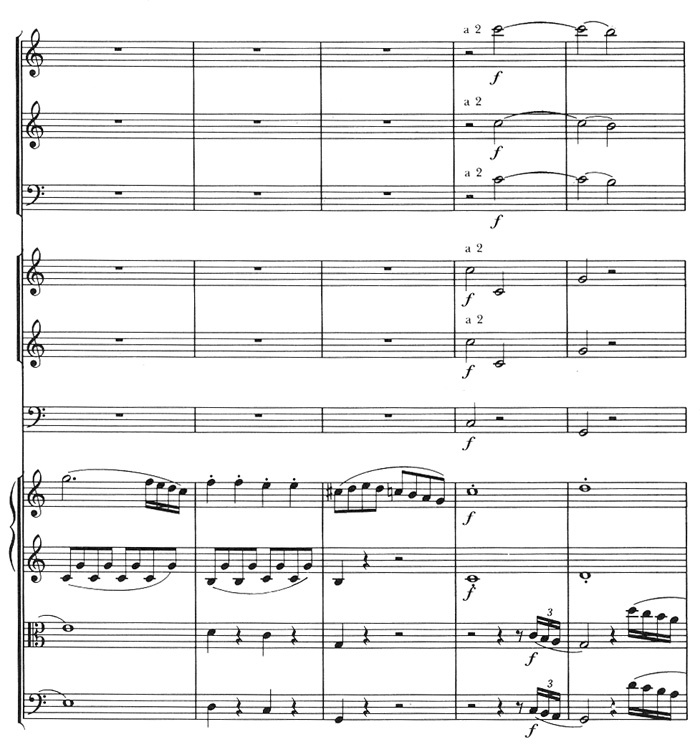 This unification and extension grow from Mozart's manipulation of the motivic figure that pervades the entire movement, involving no fewer than 80 measures in stretto. Here the texture involves stretto in thirds and sixths with two part imitation above it. The addition of piano figurations and chords increases the complexity of the texture without extending the movement. With further regard to the use of stretto in Concerto K503, one finds that the imitation occurs most frequently in the orchestra with the accompaniment relegated to the piano (measures 129-35, see Ex. 6). There are not only two melodic strands in the piano here, but two other voices in the viola and cello. Later the addition of more voices adds to the possibility of greater extension and thickens the texture (measures 308-13). In addition one finds both imitation and accompaniment in the orchestra (measures 18-24). Later the material divides between the solo and tutti (measures 129-35). One reason that the piano only rarely enters into such imitative treatment may be its primary role as soloist rather than coequal with the orchestra. Dialogue serves as another important technique for the extension of the "sonata-form." As mentioned before and as defined here, it differs from stretto in that the parts do not have to overlap to result in polyphonic texture. Pure dialogue is the response of one voice to another, involving only one active voice at a time. However, the term dialogue suggests the involvement of many instruments. Thus the important point remains that no matter how many voices ultimately participate in the dialogue, the texture remains basically one-voiced at any given point. Dialogue enables Mozart to expand his use of the musical materials such as in P Trio K496. This manipulation of the thematic materials at times results in double expositions of the theme. The exposition of P Trio K496 grows, owing to this treatment. The violin completely restates the first theme after the piano has introduced it (measures 18-23, see Ex. 7). The end of the exposition also presents a brief dialogue between the violin and the piano (measures 72-78). Thus the exposition increases by no less than 13 measures. Dialogue prolongs the appearance of the first theme in P Qt K493. Theme two receives similar treatment. 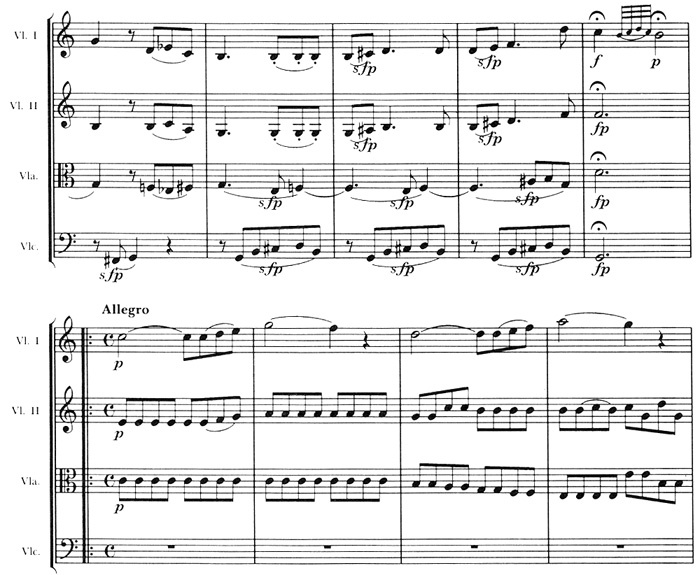 After the first statement of the second theme in the first violin, the piano expresses it again (measures 59-73). One more brief dialogue between violin and piano serves to carry the music to the development section (measures 79-85). In Symphony K551 dialogue briefly extends the exposition. 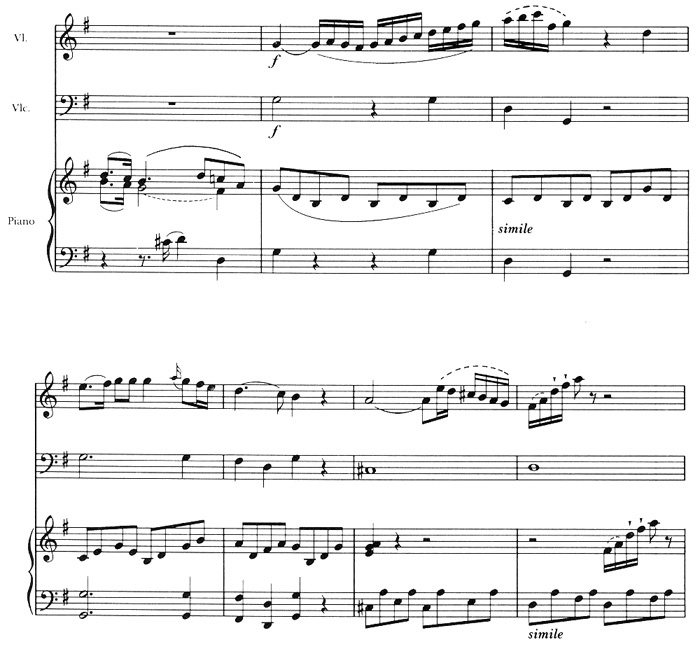 The second initial idea appears in dialogue first in the oboes and flutes, then in the violins, and once more in the oboes and flutes (measures 19-28). After this dialogue, note how the cadential material grows out of the texture and completes the statements of the first two themes in the tonic area. Thus free imitative texture such as one finds in these mature instrumental works appears in forms ranging from traditionally free imitative devices such as fugato, stretto, and dialogue to strict imitation in thirds and sixths. The sections tend to be short and the complexity of texture remains on a small scale. Obviously the sections and complex texture have a profound effect on the degree and extent of the imitation. Homophonic texture serves as an important vehicle for extending passages, appearing frequently as an ideal setting for the introduction and manipulation of thematic materials. A lucid example of this procedure is in St Qt K465 where melodic interest predominates in the first violin. Thematic statements and development in this part expand the work throughout the movement, particularly in the exposition and recapitulation (measures 40-44, 61-70, 83-91, 170-75, 180-91, 203-219). One brief exception to this treatment occurs at the end of the recapitulation, where thematic extension by the cello adds six measures (219-224). The predominantly homophonic texture throughout the coda results in an expansion that becomes virtually a second development, like that previously cited in Symphony K551. Manipulation of thematic materials by the first violin in St Qt K465 offers a setting in which the recapitulation is extended 20 measures (227-246). Thus we find examples throughout the "sonata-form" in which homophonic texture provides the settings for expansion. To be sure, we must recognize that the setting here for several instruments invites more opportunity for variety and expansion than a medium involving only one instrument. The use of homophonic texture similarly seems to open the way for expansion of the "sonata-form" in St Qnt K516. Throughout most of the exposition, this extension occurs in one voice at a time, supported by the remaining voices (measures 1-75). Twelve measures of episodic material treated homophonically separate the statements of the initial theme and the contrasting theme (measures 18-29, see Ex. 8). A homophonic extension then occurs for seven measures (48-56). 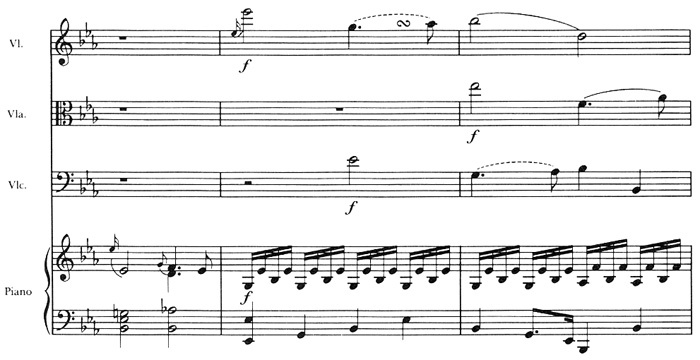 Similar treatment extends the closing theme eight measures (70-78). It also appears in the recapitulation. Homophonic texture provides a useful setting for the beginning of the exposition and recapitulation of the finale to Symphony K551. The first and second initial ideas in the exposition appear in homophonic texture. The scoring for many instruments here offers Mozart the setting for more than one statement of each of the two initial ideas, without loss of musical interest. The first idea repeats itself at the conclusion of its opening statement, but with a different accompaniment (measures 9-15, see Ex. 9). It appears accompanied the first time by violins alone, the second time by the full string section (measures 1-9, see Ex. 9). 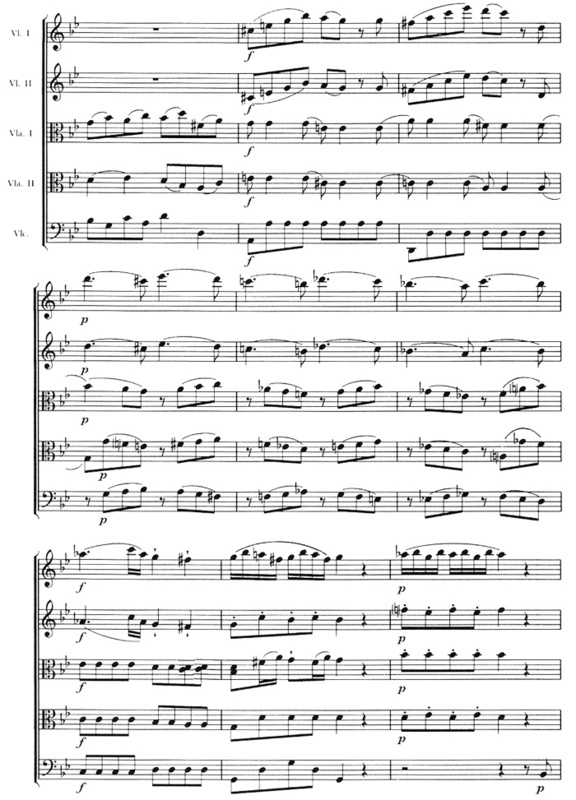 Its immediate repetition shows the second violin doubling the first violin in octaves, with syncopation in the woodwinds and more active rhythmic material in the lower strings (measures 9-15, see Ex. 9). The second initial idea undergoes three statements, each one in a different instrumental context but always in homophonic texture (measures 19-28). Growing out of this passage is a further expansion of seven measures which culminates on G in measure 35. The treatment in the recapitulation is similar, though it involves less extended use of homophonic texture. The first of the initial ideas extends briefly for nine measures before contrapuntal treatment begins (measures 233-41). Homophonic texture thus provides a setting in which the exposition expands by some 20 measures and the recapitulation by nine. Homophonic texture also provides a setting for the opening of Concerto K503 (measures 1-17). The 17 measures in the opening and 14 measures in the recapitulation (measures 290-313) are ritornello for full orchestra. These are the only two places in the movement where decidedly homophonic texture occurs, the rest of the movement involving counterpoint of one sort or another. Strictly chordal texture, which appears in only one of the works under discussion, is a special case of homophonic texture. It introduces P Qt K493, extending the exposition four measures (measures 1-4, see Ex. 10). This extension changes harmony only once every measure without losing the listener's interest. Here the scoring of three strings and piano offers enough variety to maintain the listener's interest. Indeed, without the quartet medium involving different colors, such slow harmonic rhythm might not be tolerated. Similar treatment closes the exposition (measures 89-95), opens the recapitulation (measures 149-54), and closes the same (measures 237-42). Thus chordal texture provides a setting in which the "sonata-form" can be extended by 23 measures. In the works under consideration, settings in unison and octaves occur as infrequently as strictly chordal texture. Here these settings serve two functions: to provide a setting for the extension of passages and to provide contrast to the texture for sectional changes in the "sonata-form." P Trio K496 offers a clear example. The development provides for the expansion of the music through the use of unison texture. In order to announce the appearance of the recapitulation, Mozart prefers a unison setting, first in the piano and strings and then only in the piano (measures 111-116, see Ex. 11). This adds six measures to the development without lessening the musical momentum. Not only do these measures extend the development (Mozart could have proceeded directly from measure III in the key of D to measure 116 in the key of G), but they offer a compensatory change in the contrapuntal texture that has pervaded most of the development. One more clear example of unison and octave settings that highlights sectional changes appears in Concerto K503. 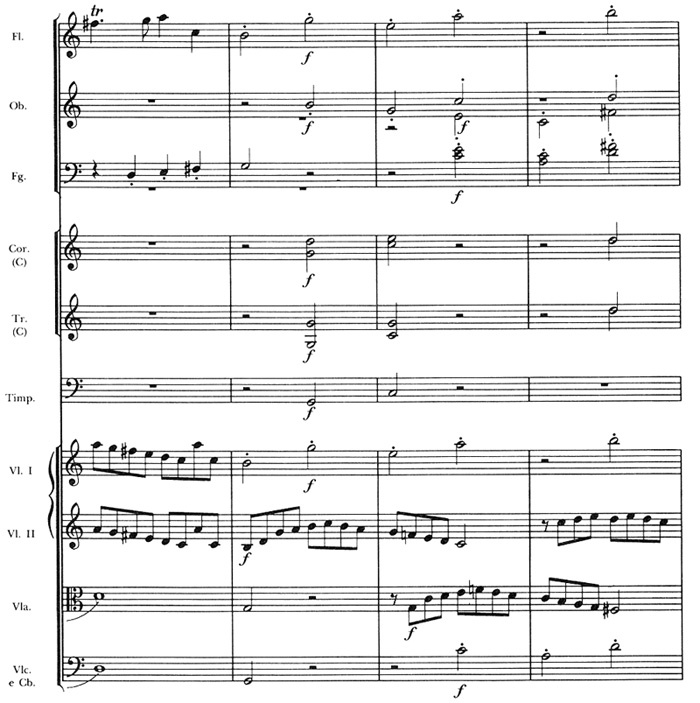 Mozart uses both unison and octave settings of the full orchestra on G to announce the end of the first part of the exposition (measures 48-49). Unison texture occurs also just prior to the start of the development (measures 226-27). Though these measures are too brief to extend the "sonata-form" seriously, they graphically highlight its sections. Instrumental treatment and textural treatment are not mutually exclusive categories. The music and the "sonata-form" on which they act as constituent elements are conceived as a complete whole, remaining stubbornly resistant to attempts to break them down into parts, no matter how valid the procedure may be. Yet, any attempt to penetrate to the essence of the scoring and its influence on the form must do just this, however subjective and artificial this procedure may appear. The very setting of a trio as in P Trio K496 seems to encourage Mozart to extend the "sonata-form." 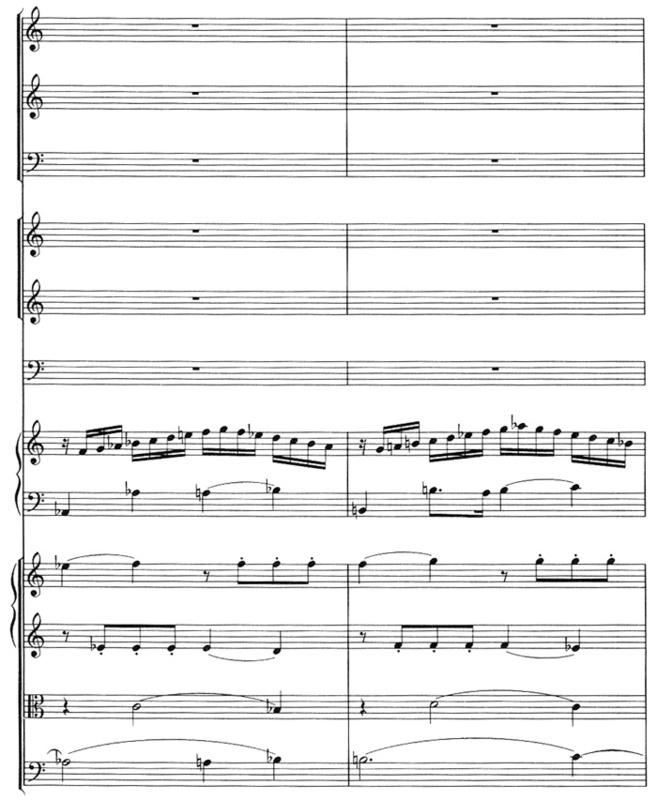 The scoring for violin, cello, and piano presents two equally important instruments, with the cello acting for the most part as a harmonic filler. The two equal instruments, piano and violin, demand equal time throughout the movement. In other words any important thematic material is likely to appear at least briefly in each instrument. This demand for equal time by each instrument results in extension of the form. For example, it results in extension of the opening theme and supplies a transition area to the dominant (measures 18-36). 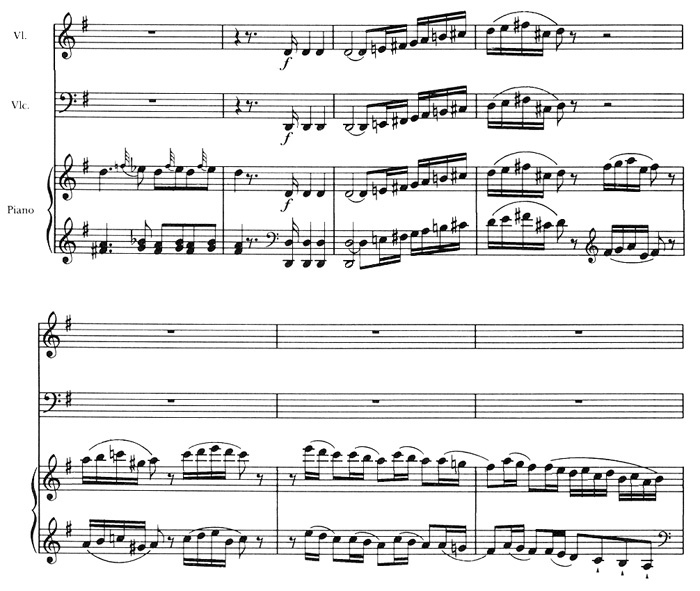 After Mozart has stated the initial theme in the piano alone, he could have progressed directly to the dominant, where the violin and cello could enter and proceed with this contrasting theme. Instead he maintains the key of the tonic, G, after the initial theme has concluded, and gives another full statement of it to the violin. Only after this statement does he begin a modulation to the dominant. Consequently, through the setting of two equal instruments and cello, the "sonata-form" has undergone a double statement of the initial idea and extension by eight measures (measures 18-25). The same demand for equal treatment continues throughout the movement. The violin and piano each serve equally well as melody instrument and as accompanying instrument. Thus in measures 44-59 they exchange melodic and accompanying roles. 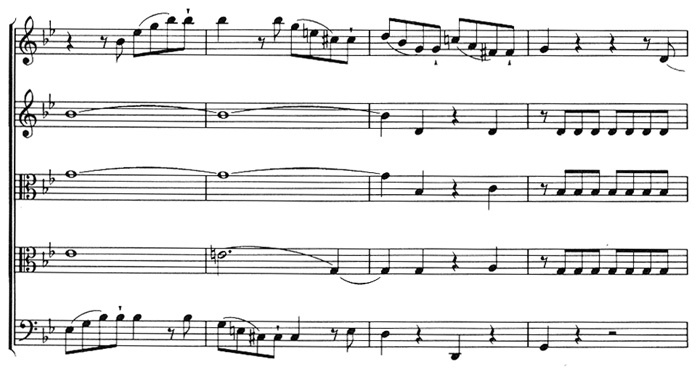 At first the piano takes the lead, with the violin accompanying (measures 51-59). This dual role by each instrument serves once again to extend the musical passages. Similar treatment also extends the recapitulation. The scoring for four strings in St Qt K465 invites a setting which exploits the string color. Mozart uses this advantage in scoring the slow introduction (see Ex. 12). The color of the four strings makes possible the slow sustention and gentle dissonance of the first 22 measures. 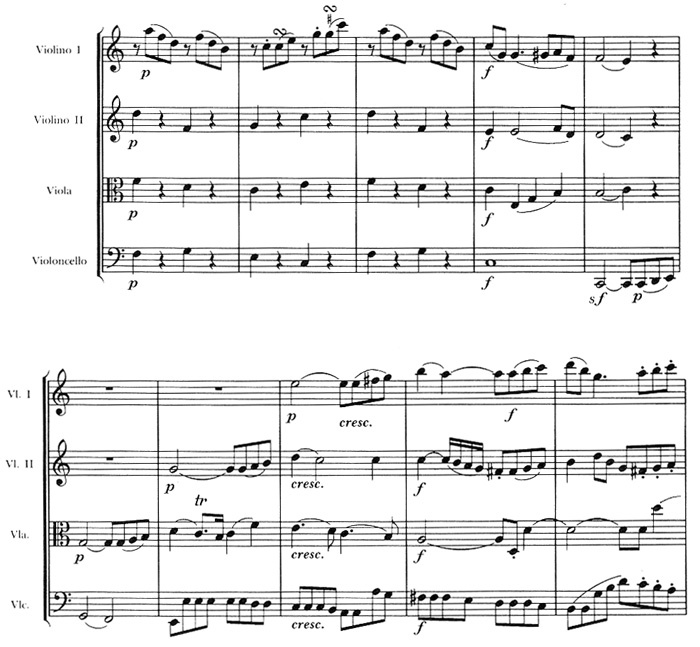 Just as Mozart exploits the many instruments in the slow introduction of a symphony, he uses similar treatment here, but on a smaller scale, in keeping with the smaller forces of the string quartet. The complete independence of each of the instruments throughout the rest of this movement offers further potential for musical extension. Thematic material not only receives consistent treatment in the first violin, as one would expect, but also in the second violin, in the viola, and in the cello. One clear example appears in measures 61-67, where the cello actively enters into the development and extension of the contrasting theme. 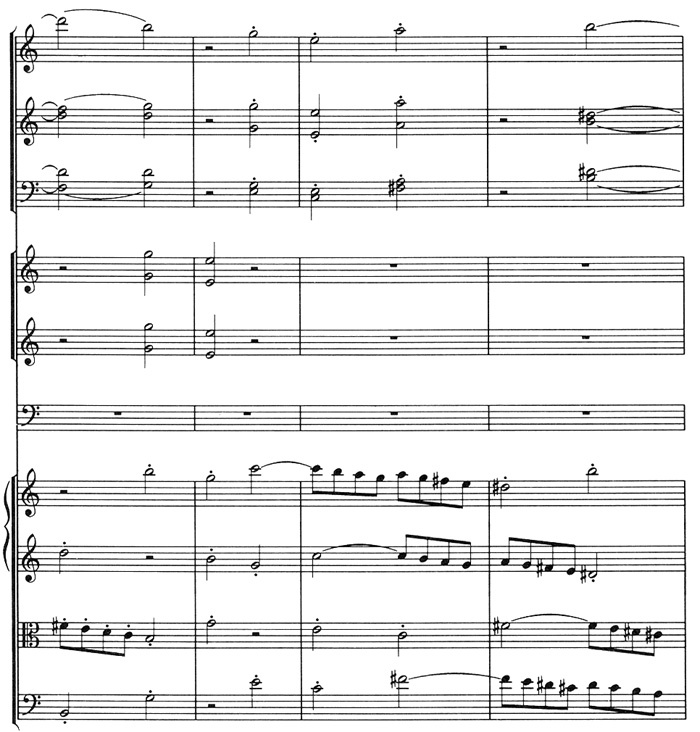 These eight measures extend the transition area from the contrasting theme almost to the entry of the closing theme. The cello also participates in thematic statements in the development section, resulting in another extension. Other examples may be seen in measures 121-30, 132-36, and 147-52. Another way in which instrumental treatment can bear on the elaboration of the musical materials may be seen in the opening of P Qt K493 (see Ex. 10). The exposition, which lasts for 27 measures, begins with sustained chords over a murky bass in the piano. The instrumental treatment in this setting is idiomatic enough to maintain the musical interest without any distinct theme, which does not appear until measure 28 and then in the dominant key of B-flat. 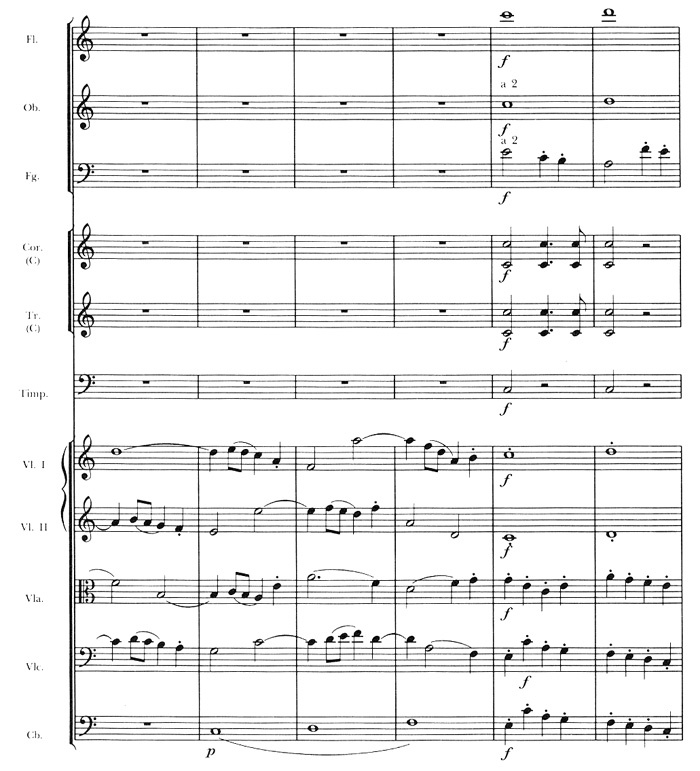 The absence of a distinct opening theme here should support my main thesis that the scoring affects the form. In other words, the different instruments offer enough variety to compensate for the lack of a theme. This procedure is less likely to occur in a work for keyboard solo or keyboard with but one other instrument. This supposition brings us back to a point in Chapter I regarding the fluidity of "sonata-form" in the later eighteenth century. The form allowed for many variations is the procedure, but still maintained its identity. Instrumental treatment in Concerto K503 seems to open the way to extensions in the "sonata-form" of the first movement. These extensions result from the opposition of two equal forces, the piano and the orchestra. Among the works under consideration, only the concerto presents two opposed forces that balance each other equally. The attempt to maintain this balance causes a conflict between the needs of the "sonata-form" and the needs for equal time on the part of each opposing instrumental body. The resolution of this conflict seems to result from the accommodation of the "sonata-form" in the form of extension, rather than from either instrumental body giving up its demand for equal time. Thus this accommodation in the "sonata-form" in Concerto K503 extends the first movement by a considerable amount. In order to prolong the tension of his move to the dominant for the entrance of the piano, Mozart maintains the key of C Major for no fewer than 120 measures. 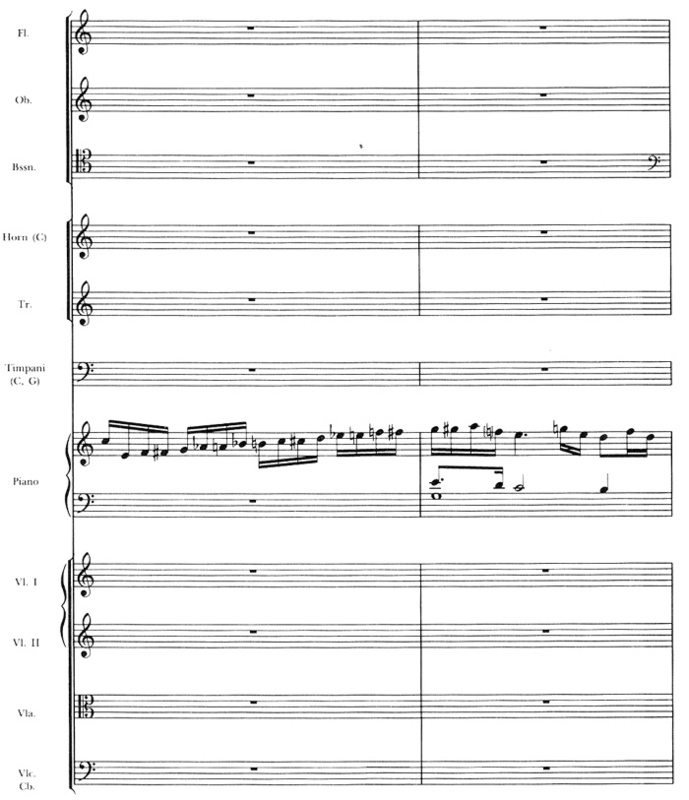 With full orchestra providing the introduction in dotted rhythms (measures 1-17), with strings providing sweeping scale passages (measures 26-46), and with the woodwinds providing the sustaining tones and punctuation (measures 18-46), Mozart is able to maintain the tonic area without loss of momentum or interest. Even more, full orchestra and piano offer so many possibilities to the composer that even after the entrance of the piano in measure 91 he seems reluctant to quit the key of C. One last time the orchestra breaks in and reasserts itself in C, momentarily forcing its material on the piano (measures 112-16, see Ex. 13), before retiring and allowing the piano equal time. Idiomatic instrumental treatment in the piano of Concerto K503 seems to keep the unusual length of the piano's entrance interesting, as well as to characterize most of its writing (measures 126-170). More specifically, how is this interest maintained? At the conclusion of the orchestral ritornello in measure 126, Mozart could have used the piano to move to the dominant quickly, in the space of a few measures if he had wanted to. However, a shortened section for the piano's first entrance would frustrate its need for equal time with the orchestra. Evidently, in order to balance the long orchestral ritornello and maintain the interest of the piano, Mozart chose to extend the transition by the use of idiomatic scales and arpeggios. In measure 140 what proves to be a theme identified with the transition occurs in the piano. Then follow even more scales and arpeggios which provide further extension. These scales and arpeggios prolong the transition area until measure 170, where at last a contrasting theme appears. In such a manner, the instrumental treatment seems to account for extension of the exposition beyond 170 measures. In any piece set in "sonata-form" in the late eighteenth century, the length of the respective sections, especially the exposition and recapitulation, usually balanced each other approximately in length. With a long exposition and a similarly long recapitulation, the development section becomes somewhat shortened, in apparent compensation. Perhaps another reason for this shortening is that considerable development already appears throughout the exposition and recapitulation. However, in both of these sections instrumental treatment in the piano proceeds with the same idiomatic keyboard figurations. Scales and arpeggios almost completely dominate the soloist's role from shortly after the start of the development section to the recapitulation (measures 262-290). Instrumental treatment in the recapitulation of Concerto K503, like that of the exposition, provides further opportunities for extension and balancing of the "sonata-form." The contrasting colors of the orchestra and keyboard offer a setting in which pianistic figurations, supported by orchestral forces, propel the music forward, extending the final section of the movement to more than 140 measures. Scales and arpeggios on keyboard alone, with no contrasting relief from another source, would probably not be endured for such an extended period. Here though, the source providing relief is the orchestral color; thus the interest of the passage is maintained. Shortly after these scales and arpeggios the transition theme appears (measure 324). With the keyboard clearly able to provide both accompaniment and thematic material, Mozart evidently sees no need for any orchestral support at all, so it drops out for 11 measures (324-335). The orchestra gradually reenters, section by section, once more helping to share the total musical responsibility with the piano, whereby the recapitulation continues even longer. Though no further statements of any previous themes occur in the piano, the music continues strong through the rest of the movement. The colors of the orchestra provide enough contrast to the piano's persistent scales and arpeggios to sustain the interest. A final aspect of the form that shows the influence of the scoring is the cadenza. It is true that in some of Clementi's and Mozart's piano sonatas for solo piano, one can find places for a cadenza. However, these appear to be the exceptions and perhaps were initially conceived as concertos. Nevertheless, the expected cadenza by the soloist in Concerto K503 not only serves to extend the compass of the movement, it also functions as what Vincent d'Indy calls a terminal (or second) development. It seems that this extension occurs for several reasons. 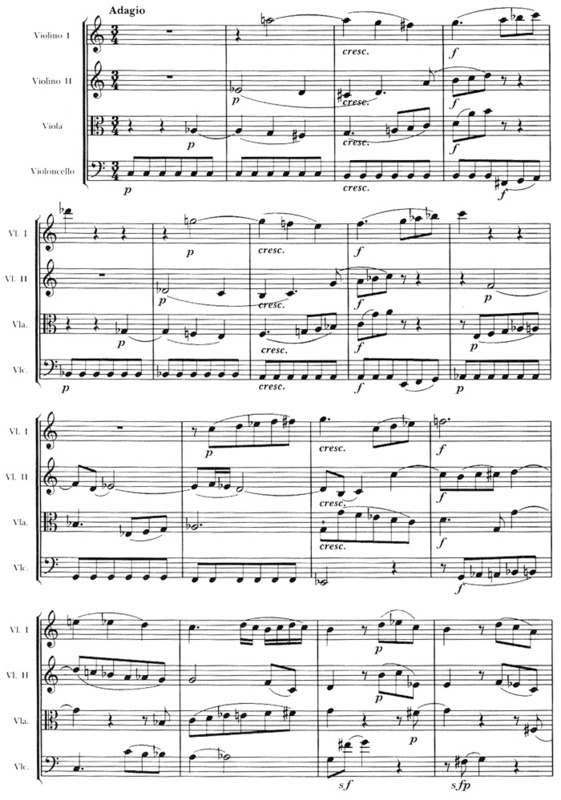 First, the concerto form favors virtuoso display; thus the scoring encourages virtuosity over formal considerations. 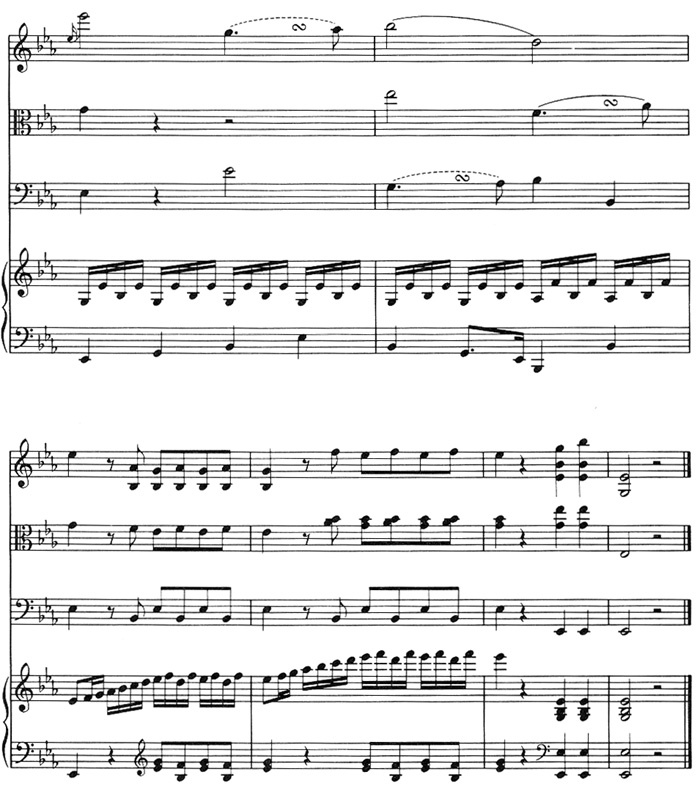 Second, the use of a cadenza elevates the piano to an even higher place of prominence than it would otherwise hold during the course of the movement. Finally, as discussed above, the demand for the piano to have equal time with the orchestra necessitates an extension of its part to balance its silence in the orchestral ritornellos. Thus the opposition of two equal forces in the scoring of Concerto K503 tends to extend the "sonata-form." This extended length in the development and recapitulation, and the prolonged tonal areas (especially in the exposition) suggest the influence of idiomatic and oppositional treatment. Perhaps the limited number of themes could be attributed to the scoring where the variety offered by the many instruments provides a setting for greater development. 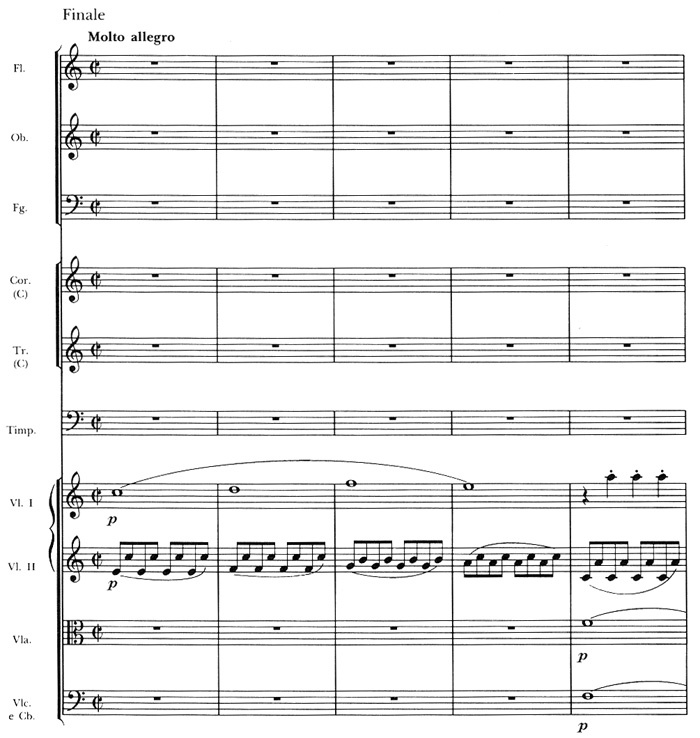 However, in Symphony K551, where one finds similar orchestral forces, one finds five main themes. 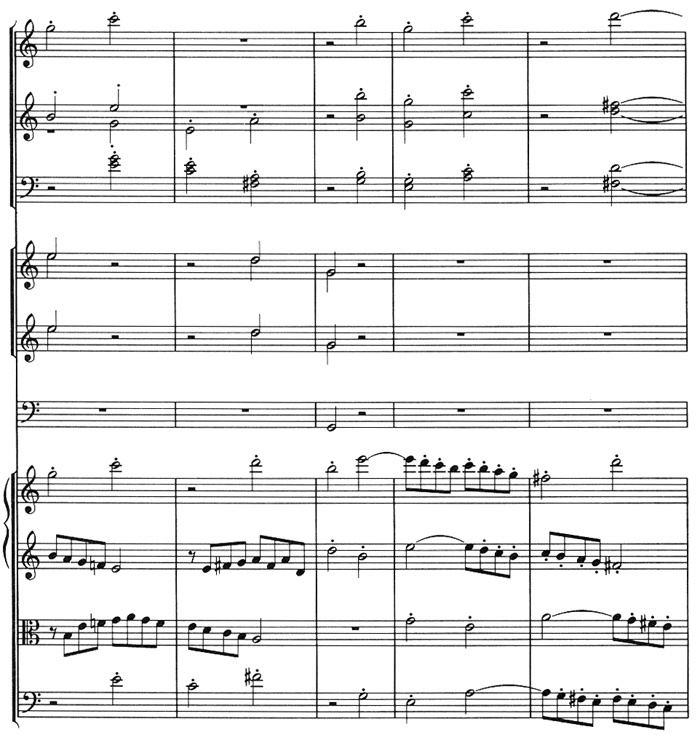 Consequently it seems wisest to say that the instrumental setting offered by the concerto scoring provides Mozart with enough variety of orchestral colors to significantly extend the movement with a fewer number of themes than one would normally find in a score of fewer instruments. In the corpus of Mozart's works which have been examined, the effect of scoring on the "sonata-form" proves to be one of expansion, both lengthwise and tonally, and complexity of treatment of the musical materials. The variety of scorings, from trio to full symphonic orchestra, offers enough potential for contrast and musical development that the compositions undergo considerable extension and elaboration. More specifically the textural treatment (polyphonic, homophonic, monophonic, and chordal) and instrumental treatment in these works enables Mozart to manipulate the musical materials in a more varied and extensive manner than would be likely in a solo piano sonata. One might argue that all art is a problem, of change under identity, or variety within unity. Thus the more time spent on variety, such as canon, fugato, stretto, and other devices, the more time can be spent on the unifying elements, such as the "sonata-form," to achieve the balance important in eighteenth-century music. Consequently the more variety in the music, the more extension one expects in the unifying "sonata-form" as compensation. 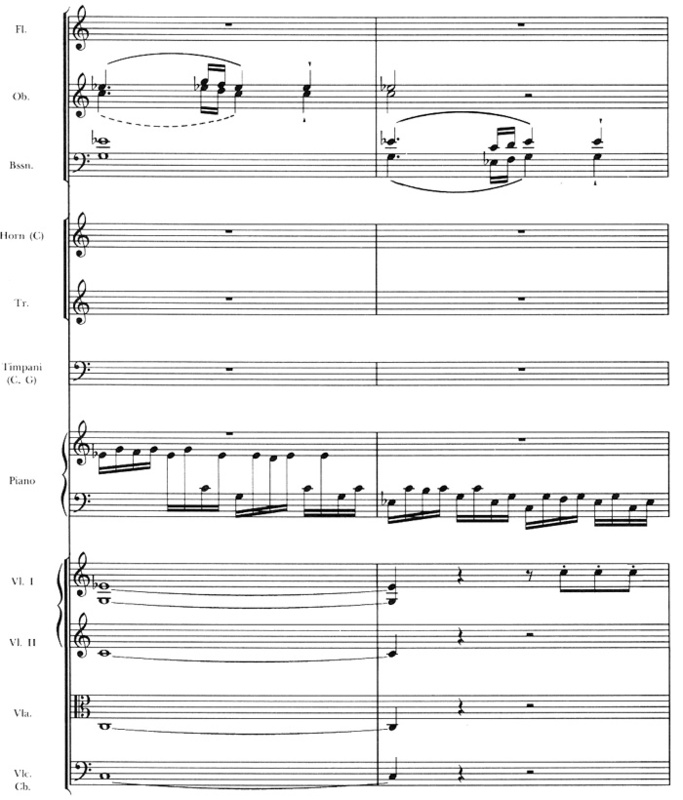 The conclusion, then, is that this unifying "sonata-form" becomes expanded or contracted, depending on the need for compensation in the amount of variety found in the score. By implication, the symphony and the concerto should offer the most variety due to the greater number of instruments. This variety in turn should necessitate an extension of the "sonata-form." This study reveals just that Symphony K551 and Concerto K503 contain more variety and are longer than the other works. By further implication, the other works such as the trio, quartets, and quintet, should contain more variety and length than the solo piano sonatas. This study corroborates that statement. The fugato in St Qnt K516, the extensive stretto in P Trio K496 and P Qt K493, the homophonic textural treatment in St Qt K465, with many other possible examples, show that many instrumental parts invite considerably more variety and a resulting expansion of the form than is likely in a more limited medium. 1William S. Newman, The Sonata in the Classic Era (New York: Norton, 1972), p. 478. 2In the following discussion I have relied heavily on Newman and his writings about the sonata, except where indicated. 4Charles Rosen, The Classical Style (New York: Norton, 1972), p. 30. 5William S. Newman, "The Recognition of Sonata Form by Theorists of the 18th and 19th Centuries," Papers of the American Musicological Society, 1941, p. 27.